Words and Music ©Paul S Allen 1990 all rights reserved. I am a guitarist and I play various styles of music from folk to rock to classical. I write my own music too, again in various genres. (here is an example “Here In This Place” I played all the guitars and the mandolin, sang and looped the drums. Also, I am a singer/song writer you can find more about me at Dunedinmusic.com or buy my music at Amplifier.co.nz ). My Guitars - 1 electric, 2 steel string acoustic guitars one with alternative tuning, a classical guitar and a mandolin. If I were to just rely on a single guitar which would I choose, and would I be able to play all the music I like. As I was thinking about this this mirrors life in many ways. so here are some parallels from the humble guitar. 1. 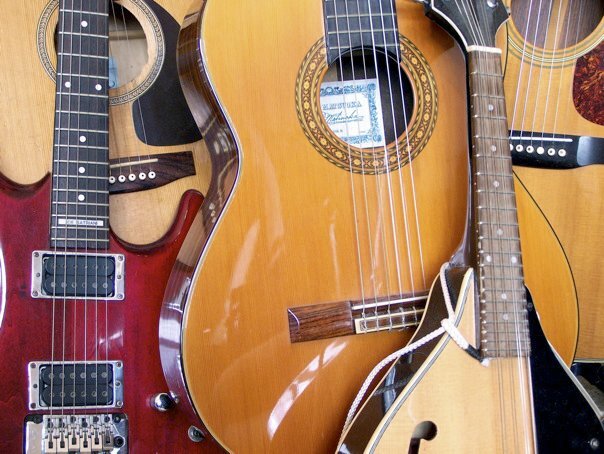 There is more than one type of guitar. You need to choose the write guitar for the purpose and sound you wish to achieve. The right tools will always make your tasks easier. 2. Make sure the guitar has the right number of strings. Generally a guitar has 6 or 12 strings but some have 7 and bass guitars have usually 4, 5 or 6. Again the sound that you will make will depend on the number of strings your guitar has. 3. The guitar has to have all of the right components. A guitar has a number of strings, a head to keep it tuned, a long neck, a body, a bridge to anchor the strings, but without a player the guitar will remain silent. 4.Guitars need the right amount of stress and tension to make a good tone. We need the right amount of tension and stress in us to shine as a guitar needs tension and stress for it to make music. Too little and the guitar will not sound and too much and the guitar will break. 5. Keep it tuned and replace the stings from time to time. Nothing worse than the sound of a badly tuned guitar or lifeless flat strings. Have a maintenance programme for yourself and your skills. 6. Unless it is played it will not make a sound. Use your skills and abilities often. 7. The shape or type of guitar does not determine whether it produces good music, the player does.